I simply cannot recall seeing so many new products hit the scene, each with so much potential to change the way we run a reef tank and shifting paradigms about how certain pieces of equipment should work. Many of these products were revealed for the first time at the Marine Aquarium Expo in Spring but others have just started to gain exposure in the marine aquarium industry. The Twin Arc metal halide lamp is one of those game-changing products that no one could have seen coming. The Twin Arc bulbs are a standard metal halide bulb which contains two separate inner envelopes. When the Twin Arc bulb is fired, a component within the bulb remembers which envelope was last fired and it directs the current towards the other envelope. The bulb fires the inner envelopes in alternation and in it’s most basic application the Twin Arc uses two envelopes of a single color either in 10K, 14K or 20K. In it’s most exciting form, the Twin Arc comes with in a dual colored bulb with one envelope pushing 10K colored lighting and the other envelope pushing 20K colored lighting. So each time the dual colored Twin Arc is fired it alternates between pushing “full spectrum” 10K colroed light which is most conducive for growth and 20K colored light which is most conducive to showing off and encouraging coral colors. 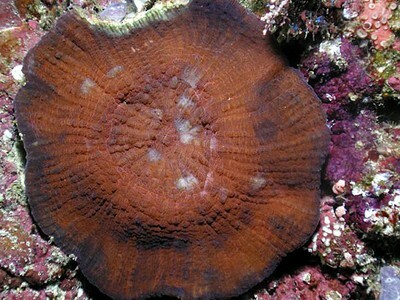 Coral farmers have long tossed around the idea of growing corals under full spectrum light and then coloring them up under bluer light for producing more colorful and desirable corals. The concept of growing corals under lights of multiple colors is not a new one, reefers have been using separate lamps of different colors as long as they’ve been available. Now the multi colored approach togrowing corals is easier than ever; if an aquarist is using a dual colored Twin Arc bulb they can easily switch between the best of both worlds using a simple timer to turn the lights on and off twice a day. We’ll have to see how these bulbs hold up in real world applications but we’ll be happy even if we just get a single colored Twin Arc lamp which lasts twice as long. The new aquarium lighting company Advanced Lighting Solutions was not content to have simply one revolutionary product on the market so they also released a full line of LED striplights. The line is segmented into the Mini-Mag for pico tanks, the regular Mag Lights and the full length Mag Pro striplights which come in white, blue and mixed light configurations. Unlike the complete stand alone LED light fixtures which are very expensive or no longer warrantied, the Mag LED striplights are modular in nature and they install exactly like one would expect for a striplight. If we were betting folks we’d wager that the ALS LED lights will be the product line which introduces LEDs to the reefing mainstream because there are two very special aces to the ALS LEDs. First of all, all of the LED striplights are available in a actinic only coloration. LED lights have long been most efficient in the blue spectrum and it is natural that we would now have actinic LED striplights to replace regular actinic 03 and super blue flavors. Now I can already hear all the die-hard VHO actinic fans crying bloody objections to defaming their beloved fluorescent actinics but the quantity and intensity of fluorescence exciting spectrum emanating from actinic LEDs will just about make you forget all about the blue tubes. With fluorescent actinics the 420 and 470nm spectrums are packaged separately meaning that you have to have some actinic 03 bulb and a “super blue” lamp to cover the fluorescent spectrum. With the ALS actinic LED striplight, the proprietary blend of their diodes actually have a broad light emission curve which ranges from 420-460nm meaning that a single striplight can excite more fluorescence than any single fluorescent lamp. Furthermore, ALS hasreleased an Actinic LED striplight which is designed to attach to existing metal halide pendants so that the LEDs can function as the sole source of supplemental blue light. What is most unique about the ALS LED strips is that they are engineered for long term performance. When comparing different types of light sources many aquarists tend to use watt as the metric of comparing how much power a light source can deliver. However, unlike halides and fluorescents which are designed to operate at a certain power level, the silicon based LEDs are more like a computer CPU which can operate at a range of power levels. AS you might expect, the luminous output of LEDs is not the same whether they are operated at 50% or 100% of their nominal rating. On the one hand a 1 watt LED can bu run at 1.5 watts and it will put out more light but the efficiency and life of the LED will be greatly reduced. However, if you take a 3 watt LED and run it at 1 watt, the luminous efficiency is at it’s peak and the life of the bulb is greatly increased. The ALS Mag Pro LED Striplights use exactly this latter scenario with 3 watt LEDs that are operated at 1 watt. In thisconfiguration the lights put out about 100-110 lumens per watt and they are expected to still be at 70-80% intensity after 5 years of operation. Plasma arc lighting is such a new technology that we are surprised to already see a prototype plasma arc light running on a reef tank. Although the plasma arc light from Luxim only hit the mainstream press in the spring of 08, the pioneering techies over at Aqua Illumination couldn’t wait to get their hands on the first round of developing kits for the plasma arc light so they could start pushing the envelope. Plasma Arc Lighting was developed by Luxim Corportation, the same manufacturer of many of the better high-ouput LEDs. The Plasma Arc lamps are fully dimmable and the 250 watt pill can put out up to 140 lumens per watt which is twice the efficiency of compact fluorescent lamps and still a good deal better than the 90-110 lumens per watt of high performance LEDs. The plasma arc light is similar to a metal halide lamp in that the bulb is made up of a small, gas and metal halide filled inner envelope but the similarities end there. The plasma arc lamp is nothing but this little glass envelope and it has no contacts or additional components like a metal halide lamp. Instead, the plasma arc light sits in a small driver which acts produces electromagnetic and radio frequency (RF) waves. The RF waves are directed towards the center of the plasma arc lamp where they vaporize the argon and metal halides and voila, light spills forth. One of the few drawbacks of plasma arc light is that the efficiency of light output and the color spectrum emitted is variable across it’s power range and they seem to shift color as they are dimmed. We don’t expect to see any production models announced any time soon but as it stands, we are just excited to know that the Plasma Arc light is already logging some time growing aquarium corals. Electronic aquarium controllers have been around for a long, long time but their price tag and complexity have mostly relegated their use to the uber techie reefer. 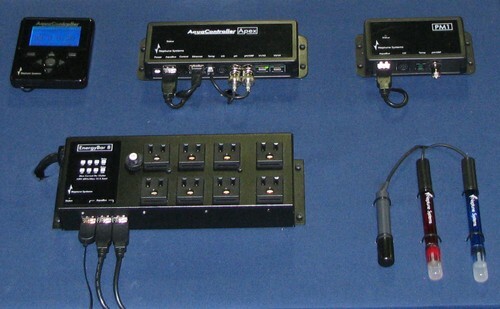 In the last few years, advancements have been made to simplify the set up and operation of aquarium controllers and the increasingly lower price of electronics has been reflected in the prices of consumer aqua-computers. The Apex Aquacontroller from Neptune Systems is one of those breakthrough products which takes a 15 year pedigree of manufacturing aquarium electronics, combines that with what people really want for their reef tanks and delivers an all-in-one package which is affordable and easy to set up. For the base price of $500, the Apex Aquacontroller System includes everything you need to get started monitoring and controlling the most common aquarium applications. One look at the Apex kit with all of it’s neatly labeled components and you get the impression that you may be able to set up the entire system without even reading the directions, let alone having to call the IT guy in your local reef club. One of the distinguishing features of the Apex is a complete separation between the base station and the controller display. The base station can be placed in a convenient place near the sump, where most of the monitoring equipment will reside and the controller display is tethered by a thin cable which can extend the controller between 20 and 100 feet away. The controller feels very much like a remote and it uses descriptive icons and symbols to quickly convey the current status of the aquarium system. The Apex is a broadly expandable, affordable and easy to set up aquarium controller and we expect this product to become the breakthrough controller which makes aquarium controlling and monitoring attractive for the wider marine aquariumcommunity. Ever since the introduction of the first VorTech magnetic water pump, EcoTech’s most frequently asked question has been whether the wonder pump would come in a smaller size. After five years of waiting, Ecotech has released the Vortech MP10, a miniaturized version of the VorTech MP40 which above all cuts down the price and the size of the magnetically coupled technology. For an msrp of $195, any aquarist can afford to invest in the efficiency of 1600+ gallons per hour with a maximum 18 watt power draw. The diminutive 2 inch by 1.5″ wetside absolutely disappears in the aquarium but yet it still pushes a nice broad, plume of water movement which is the favored method for encouraging mass water movement and gyres in reef aquaria. The Vortech MP10 ships with the same microprocessor controlled driver board with all of the adjustable, pre-programmed Vortech modes which produce constant flow, random flow, short pulse modes for producing waves and most importantly, a long pulse mode for producing gyre flow. 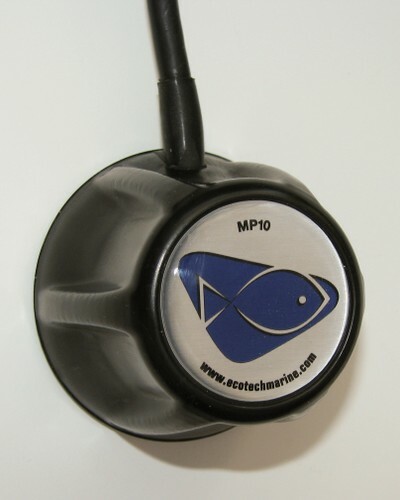 The Vortech MP10 is more expensive than many other similarly rated water pumps but the included controller, diminutive size and the aesthetic of not having any wires in the aquarium makes this propeller pump more than worth the premium. Now that Ecotech has a balanced full line of water pumps, we’re calling them out to put some resources behind accessorizing the VorTech pumps to increase their performance and accommodate some custom applications. Propellers and outlets with different flow patterns and larger common strainers to accommodate multiple pumps would really help to diversify the functionality of Vortech pumps. 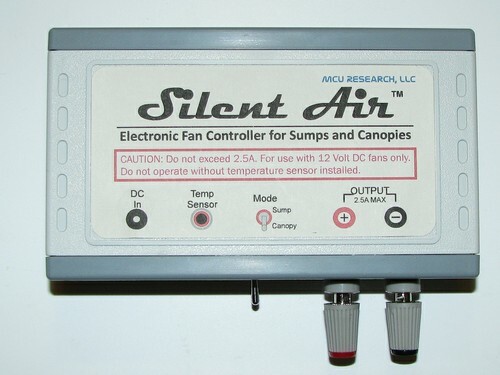 The Silent Air is a proportional temperature controller for 12 volt DC fans. The small controller box has a temperature sensor which can be used wet or dry and DC current output for up to 8 DC fans. The temperature probe can be placed in the sump or canopy and adjusted to allow for a low temperature range, sump mode, or a high temperature range, canopy mode. The beauty of the Silent Air is that unlike a temperature controller which turns on a chiller or cooling fans full blast, the Silent Air runs the fans at low speeds when there is less heat and high speed when there is more heat. Since the fans spend a lot less time running at 100% capacity, they will put out much less noise than even a chiller or fans. Since the beginning of reef-keeping aquarists have been using air circulation to help cool their aquariums. Air circulation helps to vent off the heat produced by lights, ballasts and external water pumps and it speeds up evaporation, further helping to cool the aquarium. The most traditional implementation of the air cooled approach involves the use of fans which are controlled by a timer or temperature sensor. In this scenario the fans are operated at a single speed which usually ends up being the fastest (and loudest) setting. This all-or-nothing type of operation produces an inelegant stepwise performance curve. By contrast, the Silent Air operates the fans proportionally to the temperature of the sump or canopy region and it ramps up the fan’s RPM as needed to counteract the temperature of the sump or canopy. By delivering an a cooling effect which is proportional to the amount of heat in the canopy or sump, the Silent Air will not only combat maximum temperatures ofthe aquarium but it will also stabilize temperatures overall. With the emergence of nano-reef aquariums from the reef hobby as permanent specialty segment of keeping corals in captivity, there has recently been an explosion of new products designed and built exclusively for use with nano reefs. One of of our favorite projects has been baking for over two years and it has very recently been released from the oven. Before they are turned on, Euro Reef Nano skimmers look more or less like any other skimmer: narrow cylindrical body, skimmer cup and a water pump set up in the needle wheel position. However, once you see a Euro Reef Nano skimmer in action, it is clear that the tiny little feed pump is producing tiny bubbles in quantities that seem to well exceed what you’d expect for the pump’s size. The key to the water pump’s excellent bubble production lies primarily in the unique metal-alloy mesh wheel which is made from a material that Euro Reef has been sourcing/co-developing for a long time. The new metal-alloy material looks like a pad of fine strings which has been dipped in metallic paint. In the beginning we had needle wheels with two to three rows of pins sticking out from a circular impeller. This design produced only a few layers of chopping air into fine bubbles. The new mesh wheel improves on this design by providing many more layers of air chopping making for a very consistent and dense froth. Currently the Euro Reef Nano skimmer models are custom tailored for 11 different pre-fabbed nano reef set ups and they are mostly under between $125-150. If your aquarium came with a plastic lid, chances are good that Euro Reef has already designed a nano protein skimmer specifically for your tank. 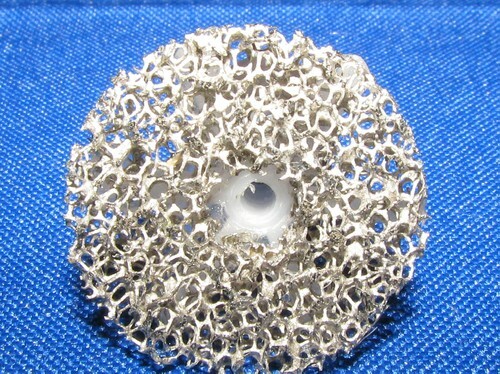 Euro Reef could do well to re-manufacture the impellers of other needlewheel skimmers using their mash-alloy material.